The city of Chiang Mai, a fertile valley of Thailand is steeped in a seven hundred year old fascinating history of upheavals, destruction and resurrection. It was the capital town of the kingdom of Lanna. Chiang Mai is situated on the bank of 340 mile long river Ping which originates from mountains north of Chiang Dao and flows towards the north. 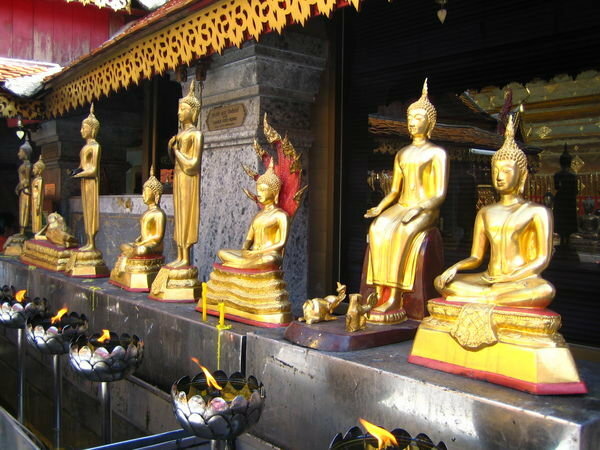 Chiang Mai has more than 300 temples, some of which date back to 13th century. You drive for half-an-hour in any direction of the city and you will come across museums, ancient ruins, national parks, waterfalls, mountain trails, numerous eclectic pleasures and many other fabulous attractions. Chiang Mai offers something for everyone from nature lovers, culture maniacs, adrenaline junkies or those who just love to lie down and indulge in refreshing spas. Doi Oi Chang or Doi Suthep-Pui National Park derives its name from a famous hermit. One of its three main mountain peaks Doi Pui is 1685 meters high above the sea level. The weather on the high altitude areas remains cool and pleasant even during the hot season when the average temperature is 20c. In winters, the weather is, of course, cold but it remains clear. The park is home to 300 species of birds besides the rare species of amphibian, the crocodile salamander. Doi Inthanon National Park Doi Inthanon is the highest mountain in Thailand. It is 2,565 meters above the sea level. The area abounds with lush green and bountiful forests with clear, cool and crisp air all the year round. There are numerous caves and waterfalls including the most beautiful of all in the Chiang Mai area, Mae Klang, Wachiratan, Sririphum l, Huay Sai Luang and Mae Pan Waterfall and so on. A huge cave called Borijinda Cave is situated in Ang-ga Inthanon mountain ranges close to the Mae Klang Waterfall. Drive right off the Chiang Mai - Hod route at km. 58, on the way to the waterfall. Turn right after 8 kilometers and go towards Doi Inthanon after about one kilometer. You will find the sign post pointing towards the cave which has many beautiful stalactites and stalagmites, appropriately called Nom Pha, or milk of the cliff in the northern Thai language. As you drive on the road to Doi Inthanon, you can spot the Royal Project Station in Baan Khun Klang, quite close to the National Park Office. During your passage over the 41 and 42 kilometers you will experience spectacular views of nature at its best from the Thailand's highest peak. Just 30 meter walk away from the left side can provide breathtaking panorama of the sea of mist engulfing the whole valley below. A little farther on the 42 kilometer span is a natural trail named Giew Mae Paan which passes through pristine forest area for about 2.5 kilometers. You can spot warblers and the kingfishers feeding on insects in the bushes. A prior permission is needed to enter this area. Mae Tho National Park consisting of mountain forests is spread over an area of around 1,000 kilometers. The average height of the mountains is 1,000 meters above the sea level. The highest mountain peak, Doi Kew Rai-mong, is 1699 meters above the sea level. The area abounds with evergreen forests in its north while there are dry dipterocarp and pine forests in Hod district and elsewhere. The area is quite inviting for many activities such as hiking and rafting in the Mae Chaem River. Chiang Mai shops offer something for everyone in its day and night bazaars. You can buy both genuine and spurious goods including art and craft products for souvenirs. There are also fashion shopping malls and Nimmanhaemin's boutiques which offer stylish home decor, knickknacks and other goodies. Umbrellas made of materials like silk, cotton, sa paper manufactured from the bark of the mulberry tree and bamboo in hundreds of designs and sizes-miniature and gigantic-- have been a spatiality of the Bo Sang area for the past two hundred years. Bangkok, Cha am, Chiang Mai, Chonburi, Hat Yai, Hua Hin , Khon Kaen, Krabi, Pattaya, Phuket and Rayong.